Today’s consumers expect immediate, personalized interactions. To meet these expectations, companies must differentiate their brands through timely, targeted and tailored customer experiences based on real-time data analytics. 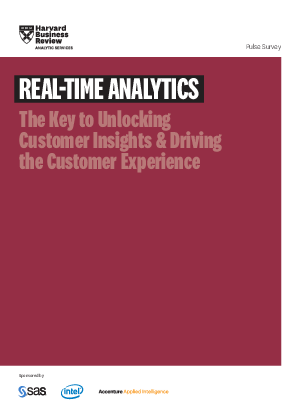 This report, sponsored by SAS, Intel and Accenture and conducted by Harvard Business Review Analytic Services, looks at how businesses are using advanced customer data analytics, along with real-time analytics and real-time marketing, to enhance their customers’ experiences. Learn why organizations that place a high value on real-time capabilities still struggle to achieve them, what companies can do to ensure success as they adopt and implement real-time analytics solutions, and what benefits successful companies are already seeing.